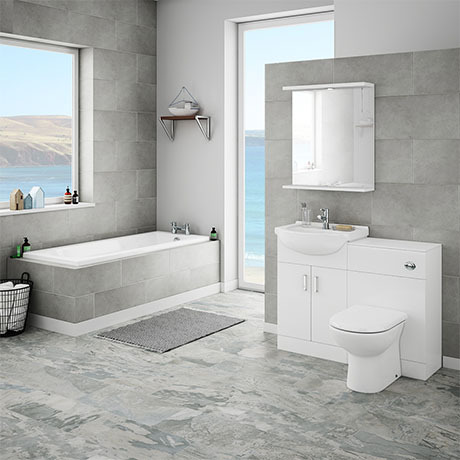 A modern minimalist white gloss vanity unit suite with quality single ended acrylic bath includes everything you need for creating a stylish contemporary bathroom. This high gloss white vanity unit suite can be used in conjunction with 300mm depth furniture from the Cove range (not compatible with Alaska furniture). Comes with a dual flush concealed WC cistern and a D shape soft close toilet seat. The back to wall unit has a removable front panel which can be drilled for right or left hand front flush. Please note, Vanity + WC unit come as 2 separate units. Available in 1500, 1600, 1700 and 1800mm lengths. Tap & any other ancillary items shown in photograph NOT included. Looks great and provides the storage we needed. Works well looks good with quality finish.